Team stadium: Boleyn Ground; the club is going to move to a new stadium, Olympic Stadium , in 2016. 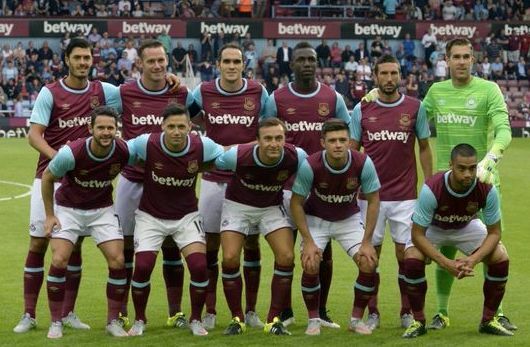 Team captain: Kevin Nolan was captain until 27 August 2015; Current captain is Mark Noble. Number of championships: Division Two – 2 times; European Cup Winners Cup – 1 time; FA Cup – 3 times; Intertoto Cup – 1 time. Number of Cup wins: FA Cup – 5 times; Football League Cup – 3 times; FA Community Shield – 4 times; UEFA Cup Winners Cup – 1 time. * Book Official West Ham United Tickets Now! * West Ham United Tickets Have High Demand, Don't Miss The Opportunity. * West Ham United Tickets Are 100% Guaranteed. West Ham United, most commonly referred to as "The Hammers" or "The Irons", are well-renowned for playing in the English Premier League. West Ham was formed in 1895 by a group of Ironworks employees, who called themselves Thames Ironworks. Despite being an amateur team, the team went onto win several local competitions, which prompted the team to turn professional in 1898 and enter the First Division. In 1900, due to various disputes and financial problems, the club relaunched as West Ham United. After this, the team's progress was fairly rocky, spending a lot of their time in Division Two and experiencing many ups and downs. In 1999, they came on leaps and bounds and finished fifth in the Premier League and won the Intertoto Cup. But after a number of key team players leaving the club over the years saw the Hammers have mixed success, sometimes finishing on the top half of the table and other times battling with relegation. From 1904 to 2016, the team played in the famous Boleyn Ground, often referred to as Upton Park, located in Upton Park, east London. But, following the growth of the team, West Ham moved into the London Stadium in August 2016 (used in the 2012 London Olympic games), in the Queen Elizabeth Olympic Park. To date, West Ham United's most successful period has been 1960s and 1970s, which began with the help of manager Ted Fenton, who led the team to the top level in 1958. The 1960s and 1970s were the club's golden age, as they won the FA Cup three times and the European Cup Winners' Cup once. Not forgetting the team's progress in the top level, which ultimately helped England to win the 1966 World Cup, due to team members from West Ham United. How to Buy West Ham United Tickets on Ticketgum? Read our terms and conditions and select "I agree"
Enjoy your West Ham tickets!